Mr. Danon said Vanguard manages New York's 529 college-savings plans and made false filings with New York that said it had paid taxes. 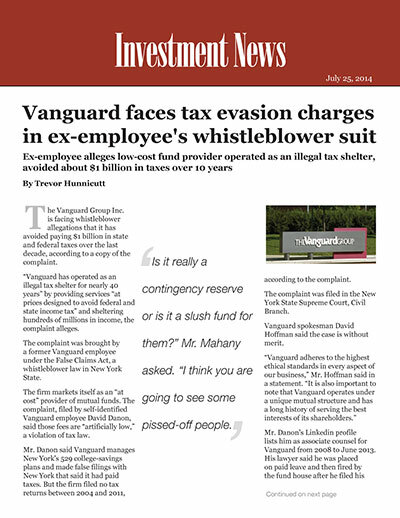 But the firm filed no tax returns between 2004 and 2011, according to the complaint. Mr. Danon's Linkedin profile lists him as associate counsel for Vanguard from 2008 to June 2013. His lawyer said he was placed on paid leave and then fired by the fund house after he filed his complaint. Mr. Danon's lawyer, Brian Mahany, of Mahany & Ertl in Milwaukee, said the fund company keeps a $1.5 billion “contingency reserve,” collected from shareholders, on which it failed to pay taxes.